Reach more readers in the southwestern Panhandle. Residents of Kimball, Bushnell, Dix, Harrisburg, Potter and the surrounding areas not only shop locally, but travel to stores in Scottsbluff, Sidney, Cheyenne, Fort Collins, Denver and elsewhere. 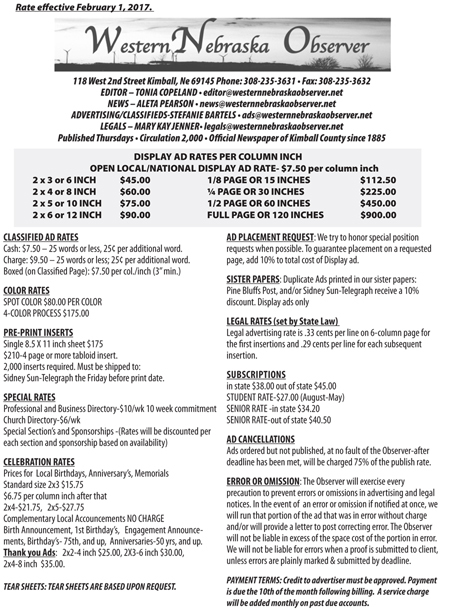 Advertise in the Western Nebraska Observer. Call 308-235-3631 or email to ads@westernnebraskaobserver.net. Serving the region since 1885.